This is a complete list of works by H. P. Lovecraft. Dates for the fiction, collaborations and juvenilia are in the format: composition date / first publication date, taken from An H. P. Lovecraft Encyclopedia by S. T. Joshi and D. E. Schultz, Hippocampus Press, New York, 2001. For other sections, dates are the time of composition, not publication. Many of these works can be found on Wikisource. The Thing in the Moonlight Nov 1927 Jan 1941 J. Chapman Miske Note: Lovecraft scholar S.T. Joshi considers this a spurious Lovecraft story. It was an account of a dream extracted from one of Lovecraft's letters by editor Miske (cf. "The Evil Clergyman", and "The Very Old Folk"), and published under a title given it by Miske. While often considered to be collaborations, the status of these works as such is disputed, despite their traditional status as belonging to the Cthulhu Mythos. The Inevitable Conflict. This was published in Amazing Stories (December 1930 and January 1931) under the name P. H. Lovering. A variety of evidence, including statistical analysis of the writing structure, has been put forward to suggest that Lovecraft was not the author. FUNGI from YUGGOTH, 6.Nyarlathotep and 7. Azathoth. 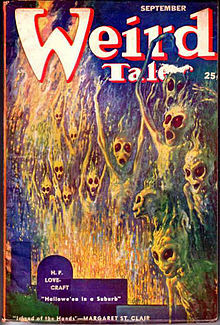 Verses printed in Jan. 1931 WEIRD TALES. To Eugene B. Kuntz, et al. Necronomicon: The Best Weird Tales of H.P. Lovecraft: Commemorative Edition (edited with an afterword by Stephen Jones) ISBN 978-0-575-08156-7 Cased; 978-0-575081-574 Export trade paperback. The Ancient Track: The Complete Poetical Works of H. P. Lovecraft (ISBN 9781892389152). This 2013 revised edition supersedes the 2001 edition from Night Shade Books, with around twelve additional poems or fragments included. ^ S. T. Joshi (2009). H.P. Lovecraft : A Comprehensive Bibliography. Tampa, FL: University of Tampa Press. ISBN 978-1-59732-069-6. These sixteen stories, listed as by "H.P. Lovecraft and August Derleth", were in fact written almost entirely by Derleth. In most cases, the stories were based on one or more ideas noted in Lovecraft's Commonplace Book; for example, "The Fisherman of Falcon Point" was based on this entry: "Fisherman casts his net into the sea by moonlight—what he finds." Plotting, description, dialogue, characterization, and other elements were entirely by Derleth. As such they cannot be classified as works by Lovecraft. In some instances Derleth incorporated actual prose passages by Lovecraft into his stories. The Lurker at the Threshold (a 50,000-word novel) contains about 1,200 words by Lovecraft, most of it taken from a fragment entitled "Of Evill Sorceries Done in New England" (see B-i-42), the balance from a fragment now titled "The Rose Window" (see B-ii-322). "The Survivor" was based on a comparatively lengthy plot sketch plus random notes for the story jotted down by Lovecraft in 1934. A descriptive passage of "The Lamp of Alhazred" was based on a portion of a letter by Lovecraft to Derleth, November 18, 1936. These extracts or paraphrases, however, have not been deemed significant enough to merit inclusion in this bibliography. ^ "Did Lovecraft write The Inevitable Conflict? by W. E. Johns". www.gordonswebsite.net. Retrieved January 18, 2016. This page was last edited on 16 March 2019, at 10:19 (UTC).